**The trails at the Torsey Pond Nature Preserve are closed for several weeks to allow for the construction of new bridging on the trails. Property Description: The 92-acre Torsey Pond Nature Preserve is owned and managed by the Town of Readfield. KLT holds the conservation easement.The preserve features nearly a mile of wooded and marshy shoreline and boggy islets, which provide excellent habitat for wading birds and waterfowl. The green trail follows a small perennial stream to the bird blind – bring your binoculars! Enjoy the lovely view and watch for wildlife from the bench. The 19th century cattle lane on the northwest boundary is a reminder of a time when pastures dominated this landscape. Directions: Take Route 17 to Kents Hill. Go north on Route 41 about one mile to the Torsey Pond Nature Preserve parking lot on the right. Canoe or kayak access is available from a public boat launch at the south end of Torsey Pond on the Old Kents Hill Road. Trails: Two miles of trails wind through a mixed woodland with a diversity of wildflowers, including a large population of trout lilies. All of the hikes begin at the parking lot on the yellow trail. The green and orange trails lead to the southern shoreland. The blue trail loops to the north and includes beautiful views of the marshlands. The red trail connects the blue and green trails. Parking: Available parking at trail head lot. 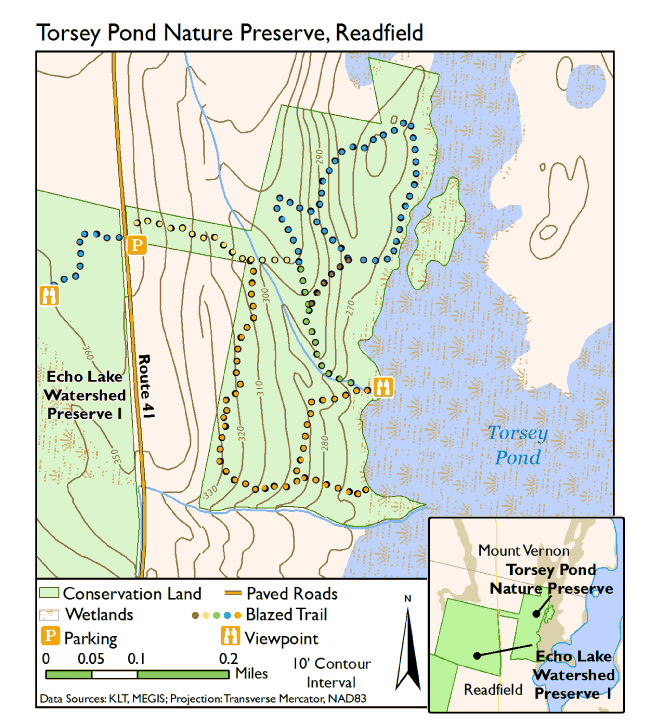 The Torsey Pond Nature Preserve has a diversity of significant ecosystems. The upland portion was cleared for pasture in the 19th and 20th centuries. Today the forest is growing back. There is a good mix of hardwoods and conifers. Birch, white pine, poplar, and red maple are found on the higher parts.